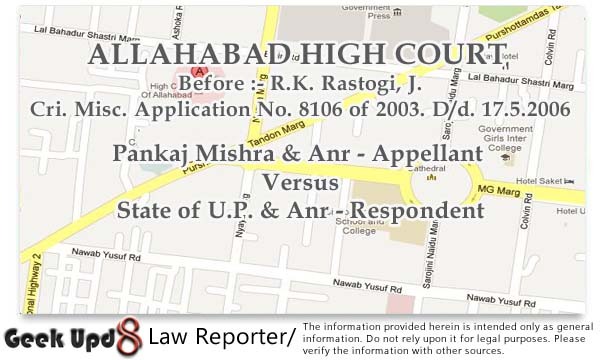 ALLAHABAD HIGH COURT Before :- R.K. Rastogi, J.
Cri. Misc. Application No. 8106 of 2003. D/d. 17.5.2006. For the Appellant :- Mr. Amit Kumar, Mr. C.L. Pandey, Mr. Samit Gopal & Ms. Renu Rajat, Advocates. For the Opposite Parties :- Mr. Kamal Krishna & Mr. Shesh Kumar, A.G.A. Headline Summary :- Criminal (Crl).Non Compoundable case to be dropped when husband and wife settled dispute amicably. 1. B.S. Joshi v. State of Haryana, 2003(2) R.C.R. (Criminal) 888 (SC) : 2004(1) Apex Criminal 197. 2. Ruchi Agrawal v. Amit Kumar Agrawal, 2004(4) R.C.R. (Criminal) 949 : 2005(1) Apex Criminal 82. 3. Syed Shabbir Hasan alias Maseeh Abbas v. State U.P., 2005 All JIC 548. 4. Shakuntala Devi v. State of U.P., 2005 All JIC 713. 5. Jaya Mishra v. Pankaj Mishra, Criminal Case No. 1254 of 2003. R.K. Rastogi, J. - This is an application under Section 482 Cr.P.C. for quashing the proceedings of Criminal Case No. 1254 of 2003, Smt. Jaya Mishra v. Pankaj Mishra and another. 2. The facts relevant for disposal of this application are that the complainant opposite party No. 2 filed a complaint against the accused applicants under Sections 406, 504, 506 I.P.C. with these allegations that her marriage had taken place with the accused Pankaj Mishra on 16.2.1997 and sufficient dowry valuing several lacs of rupees was given. However, her husband and her mother-in-law (present accused applicants) were not satisfied with dowry and they asked the complainant that she should get a house transferred to their names from her father. Her father expressed his inability to do so, and therefore the accused started to commit atrocities upon her and on 9.6.97 they forced her to leave the house. They also kept with them the entire items of dowry which were her Stridhan. She therefore filed a complaint against the accused persons and after recording the statements of complainant and her witnesses, the learned Magistrate summoned the accused persons under Sections 406, 504, 506 I.P.C. Being aggrieved with that order the accused filed the present application under Section 482 Cr.P.C. for quashing the same. 3. It may be mentioned that the accused Pankaj Misra also filed Matrimonial Suit No. 612 of 2002 against the complainant Jaya Misra under Section 13 of Hindu Marriage Act for divorce in the Family Court, Allahabad and in that case a compromise was filed by the parties whereby the parties agreed to dissolution of marriage. It was further provided that Pankaj Misra would pay to Jaya Misra a sum of Rs. 2 lacs as permanent alimony in lieu of Stridhan and maintenance etc. This amount was paid to Smt. Jaya Misra. The compromise was also verified by both the parties before the Family Court, Allahabad. A copy of the compromise and the order passed by the Family Court on that compromise have been filed in this Misc. application. It has been provided in paragraph Nos. 12 and 13 of the compromise petition that this criminal case under Sections 406, 504, 506 I.P.C. shall not be pressed in view of this compromise and the same procedure shall be adopted in this Misc. case also after filing a certified copy of the compromise and the order passed by the court on the petition. 4. Heard the learned counsel for the applicant as well as the learned A.G.A. None appeared on behalf of the complainant. 5. A point was raised before me that the cognizance had been taken by the Magistrate under Sections 406, 504, 506 I.P.C. 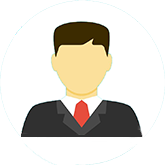 in the criminal case and the offence under Section 406 I.P.C. is non-compoundable and the accused are liable to be prosecuted. To meet this point learned counsel for the applicant has cited before me a ruling of Hon'ble Supreme Court which is reported as B.S. Joshi v. State of Haryana, 2003(2) R.C.R. (Criminal) 888 (SC) : 2004(1) Apex Criminal 197 : 1(2003) DMC 524 (SC). In this case the facts were that a criminal case under Sections 498A/323 and 406 I.P.C. was pending against the husband. During the pendency of the case, a compromise took place between the husband and wife. It was laid down by Hon'ble Apex Court that in view of the compromise between the parties, the criminal proceedings against the husband should be quashed under Section 482 Cr.P.C. Learned counsel for the accused applicant also cited before me a ruling of Hon'ble Supreme Court in Ruchik Agrawal v. Amit Kumar Agrawal, 2004(4) R.C.R. (Criminal) 949 : 2005(1) Apex Criminal 82 : 2005 All JIC 209 (SC). In this case also a compromise had been reached between the husband and the wife and so the Hon'ble Apex Court quashed the proceeding of the criminal case under Sections 498A, 323 and 506 I.P.C holding it to be an abuse of the process of the court. The above view of Hon'ble Apex Court was followed by this Court in the cases of Syed Shabbir Hasan alias Maseeh Abbas and others v. State U.P. and others, 2005 All JIC 548 and Smt. Shakuntala Devi and others v. State of U.P. and another, 2005 All JIC 713 and in both these cases the proceedings of criminal cases under Sections 498A, 323 I.P.C and 3/4 Dowry Prohibition Act on the complaint of the wife against her husband were quashed taking into consideration the compromise reached between them. In view of the law laid down in the above rulings, I am of the view that in the present case also, the proceedings of the criminal case deserve to be quashed and the present application, under Section 482 Cr.P.C. deserves to be allowed. 6. Accordingly, the application under Section 482 Cr.P.C. is allowed. The proceedings of Criminal Case No. 1254 of 2003, Smt. Jaya Mishra v. Pankaj Mishra and another, pending in the court of Addl. Chief Judicial Magistrate, Allahabad are hereby quashed. This is another citation of relevance. together or they should part their company peacefully, so that, there is peace and amity in the society. In cases resulting from matrimonial discord, the Court is not dealing with criminal but dealing with broken marriages and broken homes where resort is more often made to Sections 498A/406 Indian Penal Code, 1860 to teach lessons to the family of husband or to take revenge.